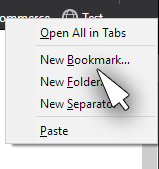 Typically, bookmarklets are saved either in your Favorites folder or if you use them on a daily basis like I do, in your browser's bookmarks toolbar. In essence, bookmarklets are sort of like browser extensions or browser add-ons, except they don't bloat your browser and take up memory. While extensions load with your browser when the browser starts, bookmarklets only run when you need them and disappear from memory when they are done. Ok, not too useful, but you get the idea! Now on to the real useful bookmarks I was talking about. I want to show you five bookmarklets that will make your life editing your Yahoo store easier - guaranteed! Please note: the following bookmarklets all require you to be logged into your Yahoo store account. If you are not logged in, all these bookmarklets will simply take you to the Yahoo store login page. Also, one disclaimer: these bookmarklets work by looking at the HTML code of the current page and trying to identify links to the cart page to figure out the store's Yahoo account ID. This works in the vast majority of cases, however, no two custom stores are the same, and yours might have a different way of linking to the shopping cart page. Unfortunately, in such cases, these bookmarklets will not work on your store. At least three out of the five won't. Edit this page and Go to this ID will still work. This bookmarklet will take you to the same page you are looking at but in the store editor. So you can be browsing your live site, and if you quickly want to go to the editor for the page you are on, simply click this bookmarklet. When you are in the store editor, you may want to quickly jump to a page whose ID you know. There are of course a number of ways to do that, for example clicking "Controls" and then Search or Edit by ID, or using the "Find" button. However, with this bookmarklet all you have to do is click while you are on any page of your store. It will prompt you for the ID, and once you enter it, you will be taken to that page. Same as "Go to this ID" but it also takes you directly to the Edit form of the target page. So this is a shortcut for going to a page with a given ID and then hitting the "Edit" button once on the page. If your store is in the middle of publishing and you don't have the publish status screen in front of you, this bookmarklet will take you to that page from any page of your live store.